A federated crew toolset for navigating, collaborating, resource management, IoT and tons of other things. This project was created on 05/26/2016 and last updated 2 years ago. What started out as a simple robotic remote control system, quickly grew into a mature approach to maritime navgiation. Since then, it has again come a long way and is now slowly, but steadily developing into a new kind of user and machine experience. HFOS is supposed to run on small energy efficient machines (RPi etc) and provide a host of services in an offline-compatible, yet federated (think of freifunk/mesh ;) way, but i recently found out, it should work nicely on your Android device as well. 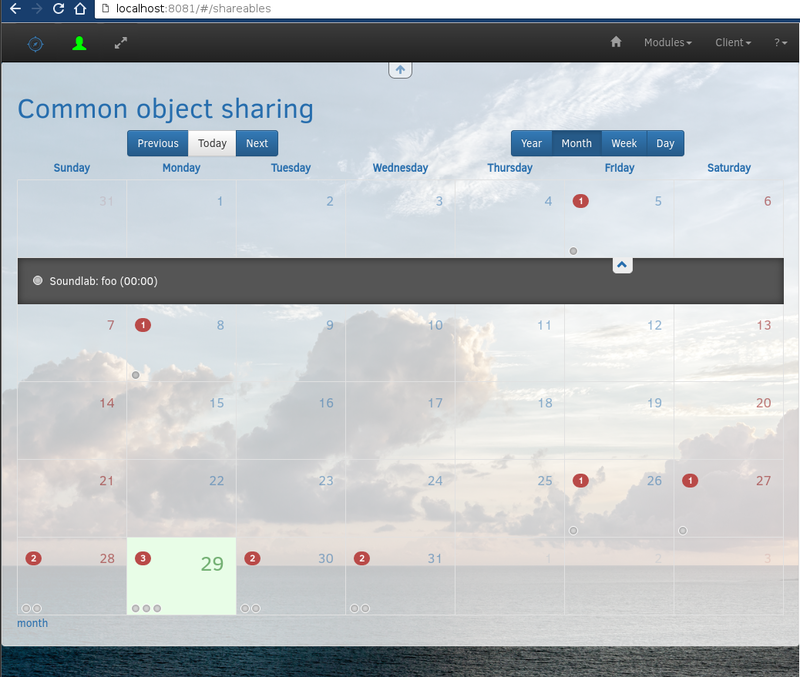 It basically consists of a backend (Python) and a frontend client app (HTML5) and focuses on small group collaboration - the missing parts for better teamwork without the need to offload your data to anyone else. Maps - again, one of the heavy topics because of the sailor-orientation, it will do waypoint planning, weathermaps (grib), and a lot of other goodies, offline via caching, free full vector maps will join soon, too. Project management - not so much focused on software but actually on my private needs - and yours? Since the system is being transformed into a modular, extensible framework, a lot of other stuff will join - writing your own modules is really easy! The newest version is rather usable! There&apos;s still a lot of important stuff missing (e.g. data migrations), but you can already dive in and test it. I&apos;ve simplified the installation method, so essentially you now only have to grab the source, install a few distro packages and run the installer. Distribution-aware packages are being prepared, i hope to get this done by 1.2. Since I work more or less alone on the project and because I am currently preparing the release of a rather major overhauled version (1.1, sporting a modular component/app-system and a lot of frontend technology upgrades, release is planned for the next few days), the project is currently not in a really useable state. So, I&apos;d be more than happy to welcome new HTML5 (Angular) and Python developers to join the fun! Map showing ESRI Satellite imagery, Openstreetmap and Openseamap along with the new overlaid Dashboard (Simulation mode) with a short route included. 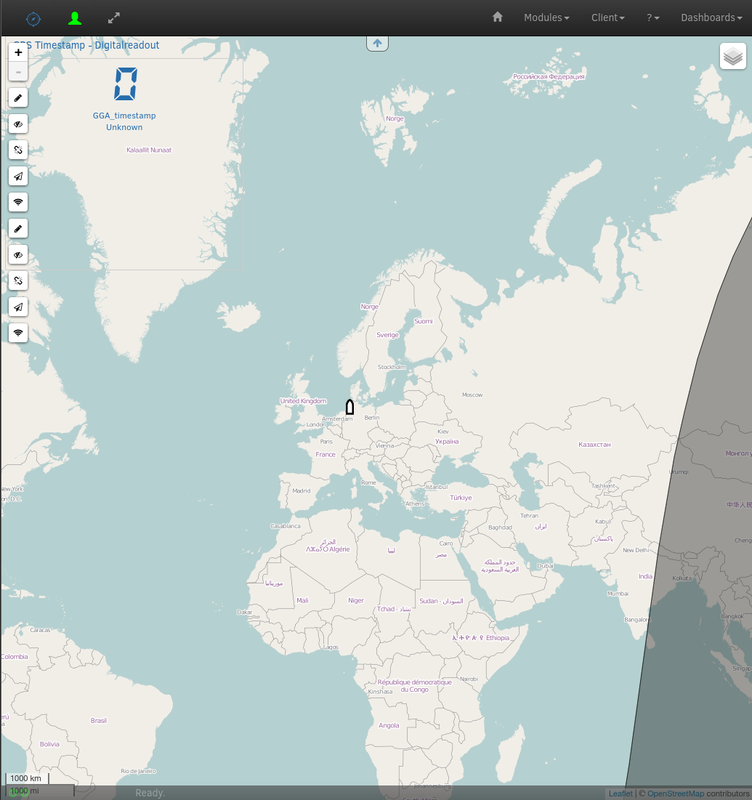 Newly added Layer selector and a nice (adaptive) coordinate grid have been added. You can import Rastercharts (KAP, more on request) into the system and use them alongside the other data sources. 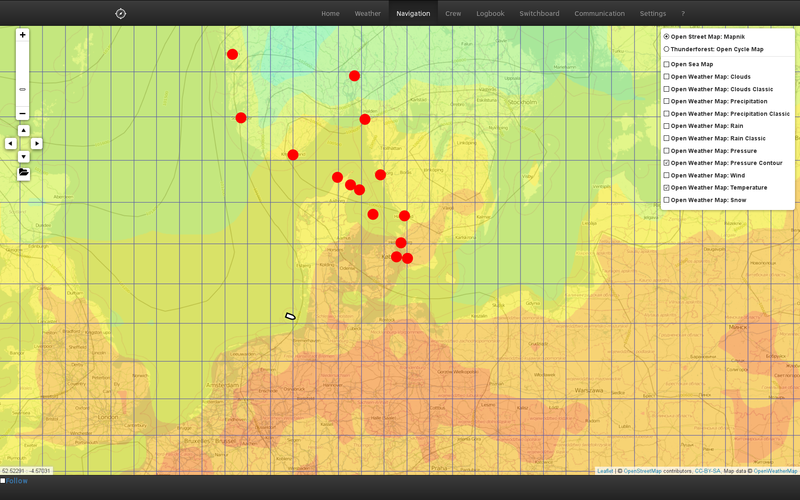 An earlier view of a chart with a few waypoints and an Openweathermap temperature map as overlay. We'll refine this to allow usage of grib-format weather data, soon. This is, how the shareable resource reservation overview looks like. Primary uses include vessel reservation for shared yacht ownership groups or managing the workshop your sailors club has, etc. You can register any object, be it a room, vessel or just a very coveted tool! 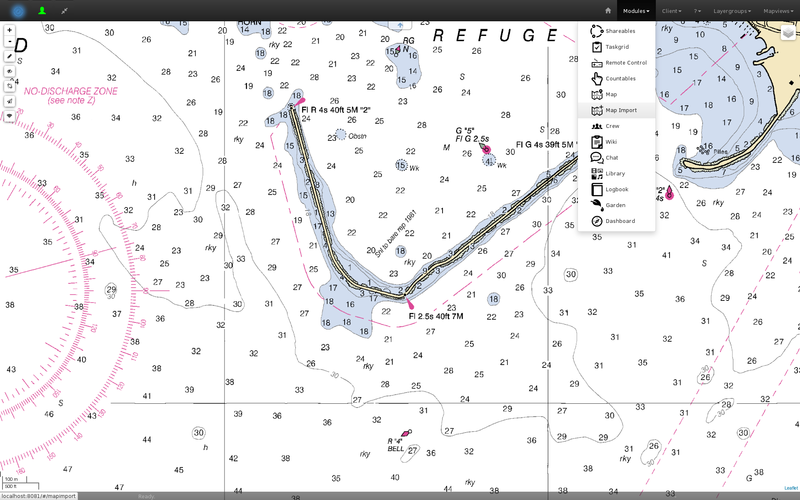 View of a rendered KAP raster chart file in HFOS' map module. Since we're using GDAL, it supports almost all of the (proprietary) raster chart formats. You can simply upload them in the application and they will be rendered as tilemap for use in the map viewer. Caution, takes ages on a Raspberry Pi! But you can prerender them on another, faster machine. Check out the official (more in depth) howto at readthedocs or on github. If you run into troubles, contact us by mail, irc or simply open an issue on our github issue tracker. Our contact info is listed in the howto, as well. Grab an embedded system - a Raspberry Pi will do, but something faster -> More fun! Of course, you can also use the machine you&apos;re using to read this or any other. Also, Hackerfleet is proud to be at the 33c3. If you&apos;d like to meet us, chat and collaborate, ping me by mail (riot@c-base.org) or irc (#hackerfleet on freenode). I&apos;ll do a lightning talk about HFOS, as well. There will be a Hackathon at the c-base in Berlin from 8.-9. this month. Join us from 11 am. BYO-BBQ afterwards/during the event! * Docker integration is now updated, i hope to get this used in Travis for CI as well. The biggest improvement - or the one with the biggest impact - is probably the new modularization concept. You can now bundle complete features into components. Those can have their own schemata, provisions, documentation and backend as well as frontend components. Most of the other work has gone into upgrading the frontend to a better structure and library stock, so it loads and operates faster and now accomodates for the frontend component handling. IOTA is an attempt to bring smart homes back to it's roots. Data accessibility. Knowing what the house is doing not just controlling it. You are about to report the project "HFOS", please tell us the reason.